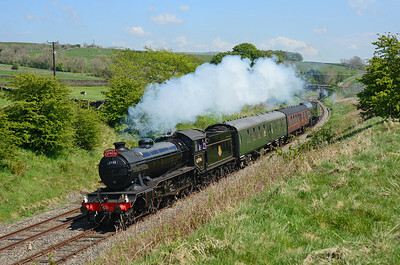 6233 "Duchess of Sutherland" passes Hincaster with a Milton Keynes bound special 22/5/10. 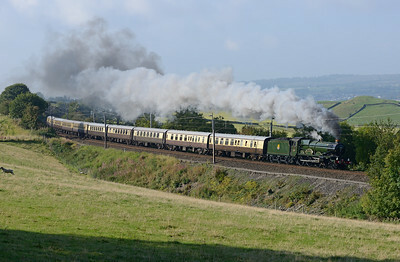 60163 "Tornado" passes Burton on an Edinburgh-Euston special 20/11/10. 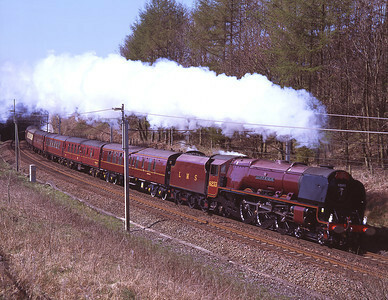 6201 "Princess Elizabeth" storms past the gallery at Great Strickland with a Carlisle-Harrow trip 11/5/02. 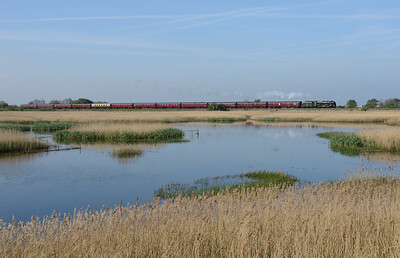 6233 "Duchess of Sutherland" passes Beckfoot on a Lincoln-Carlisle charter 18/4/09. 75019 worked a freight charter from Carnforth-Skipton on 26/2/00 seen near Clapham. 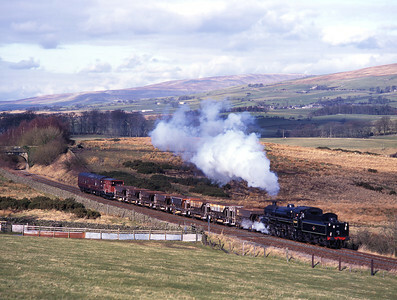 8F 48151 hauls a Wigan-Scarborough special at Keer Holme 6/5/00. 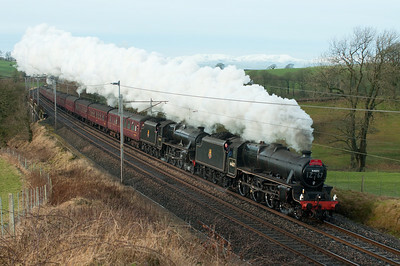 6201 Princess Elizabeth storms past Docker with a Tyseley-Glasgow charter 12/11/11. 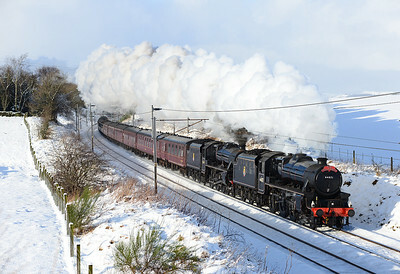 Black 5s 44932 & 45305 hurry a Euston-Carlisle charter up Grayrigg bank 18/2/12. 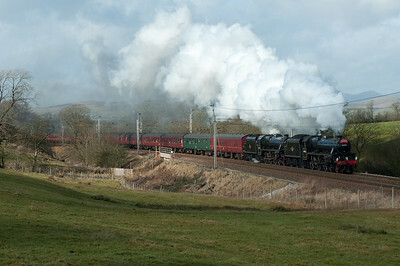 Black 5s 44871 & 45407 storm past Docker with a Manchester-Carlisle special 28/1/12. 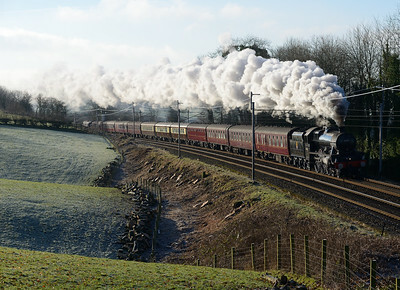 44871 + 45407 storm past Docker on a Manchester-Carlisle special 26/1/13. 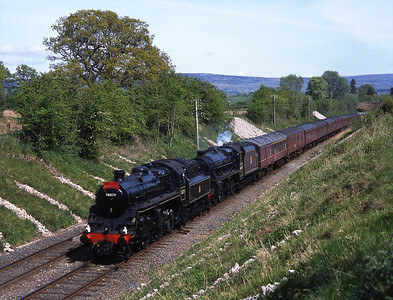 A rather hurried shot of 61994 "The Great Marquess" and 60009 "Union of South Africa" en route from York NRM-Carnforth at Armistead 26/5/13. 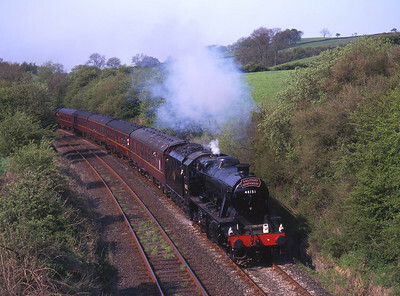 46115 "Scots Guardsman" passes Leighton Moss with the empty stock for the Grange-Edinburgh leg of the Great Britain VII tour 29/4/14. 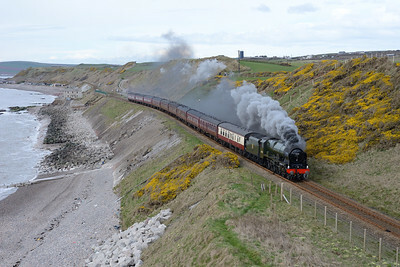 46115 "Scots Guardsman" passes Grange on a Carlisle-Euston return charter 12/4/14. 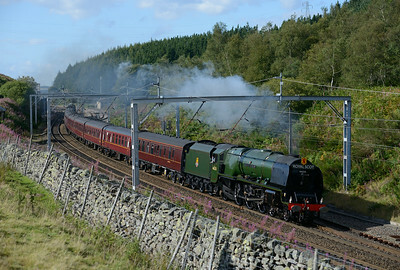 46233 "Duchess of Sutherland" cruises over Shap summit with a Carlisle-Crewe special 30/8/14. 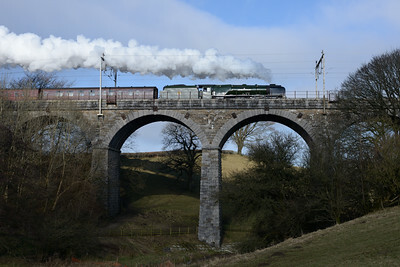 46233 "Duchess of Sutherland" crosses Docker Garth viaduct with the Winter Cumbrian mountain Express 7/2/15. 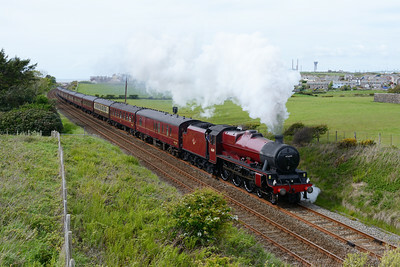 45699 "Galatea" hauls a late running Sellafield-Euston charter at Seascale 30/5/15. 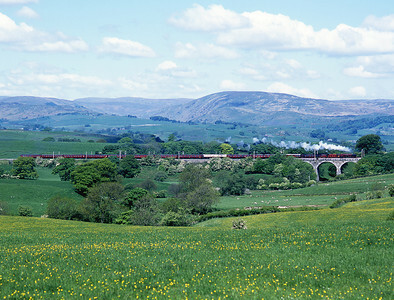 6233 "Duchess of Sutherland" crosses Docker viaduct with a Birmingham-Carlisle special 22/5/04. 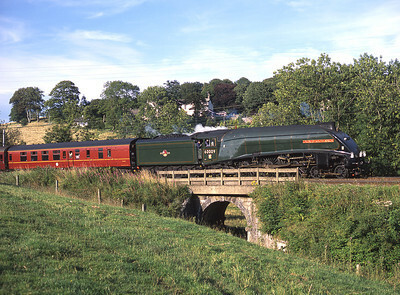 60009 "Union of South Africa" approaches Oxenholme 2/8/03. 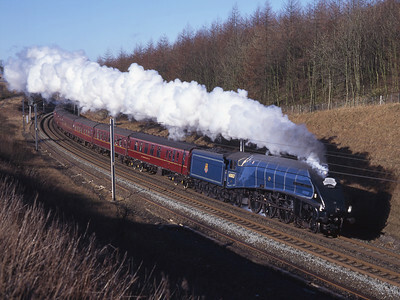 60007 "Sir Nigel Gresley" passes Beckfoot 8/3/97. 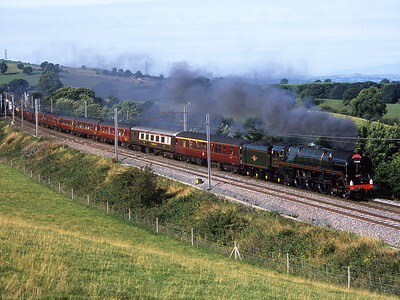 46233 "Duchess of Sutherland" passes Milnthorpe with a return Cumbrian Mountain Express to Manchester & Crewe 15/8/15. 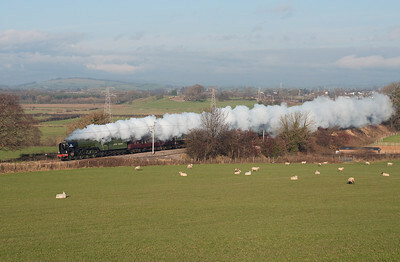 5043 "Earl of Mount Edgcumbe" startles the sheep at Hayfell with a Tyseley-Carlisle special 19/9/15. 46100 "Royal Scot" passes Nethertown with a Carlisle-Euston charter 9/4/16. 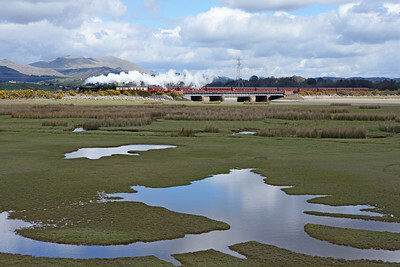 A busy day for charters on the coast; 46100 "Royal Scot" crosses the Duddon viaduct with a Crewe-Carlisle charter 16/4/16. 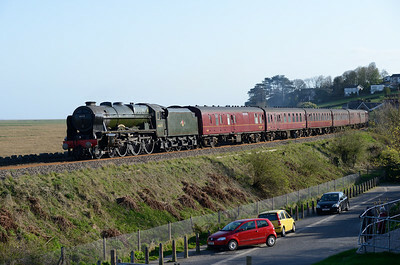 45699 "Galatea" and support coach head from Steamtown to Sellafield at Lady Hall to take over a Carlisle-Bridlington charter 16/4/16. 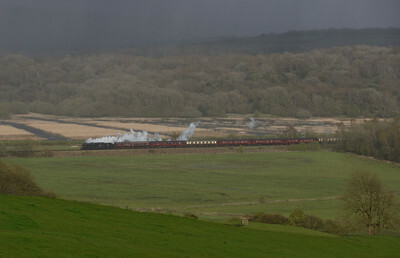 Inbetween wintry showers 44871 hauls "The Great Britain IX" at Black Dyke heading for Grange over Sands, 28/4/16. 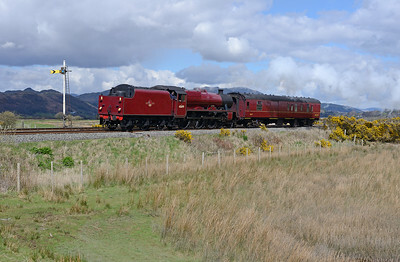 A Kings Cross-Carlisle charter passes Duncowfold hauled by 76079 & 45407 14/5/15. 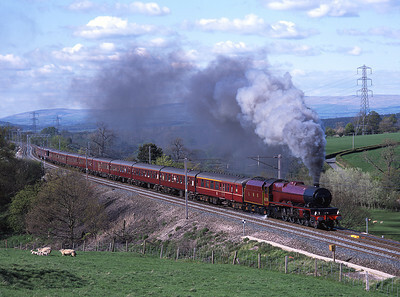 71000 "Duke of Gloucester" hauls a Crewe-Appleby charter at Lambrigg 3/9/05. 45690 "Leander" hauls a Manchester-Carlisle charter near Oxenholme with a shove from 37706 on the back 21/1/17.